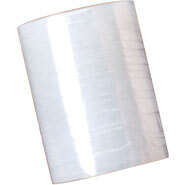 Our 5" x 1000' x 33 Ga Pre-Stretch Stretch Film retains its grip and is self-adhesive. The clear residue-free film is pre-stretched and equivalent to 8.5 mic, which contributes to lower packaging cost and a firm hold. Our 5 in. x 1000 ft. x 8.5 Ga Pre-Stretch Narrow Stretch Wrap easy to use roll increases efficiency, and the clear cast film enables easy identification during shipping.